Home » travel » packing tips » Traveling Abroad? Skip the Power Strip. If you’re headed to a country where the electricity runs at a different voltage (i.e. if you’re in the US and going to Europe) you probably know that you need a plug adapter in order to plug your laptop or other device in for power. If you have a few devices that need power and are tempted to bring a power strip so that you only need one plug adapter, you may want to reconsider. First, if the power strip has any kind of surge protection built in, it’s probably designed to work only on your country’s voltage and probably won’t work properly (and may even get fried) on a different voltage. Even if it’s just a basic power strip without surge protection, that’s still overkill in terms of size and weight for the kinds of small devices you’re probably traveling with, such as your laptop, mobile phone, etc. You can accomplish the same thing with much less size and weight by using a simple plug splitter, which usually split one outlet into three. Better yet, pick up a basic extension cord that has three outlets on the end, which can be found for under $2. Having a six-foot extension cord can be handy in developing countries where electrical outlets aren’t placed as frequently. In guest houses, hostels and small hotels, sometimes there’s only one outlet, right next to the door, which is an inconvenient place if you want to plug your laptop in and sit in bed. Note that these cords are only for the two-pronged variety of plugs, so if you have a cord with a 3-pronged, grounded plug, you’ll need the appropriate plug adapter – or a grounded plug splitter and grounded extension cord. If you want a surge protector specifically for your laptop, there are small, in-line surge protectors available which can give you that protection without weighing down your bag and which work on 120V (U.S.), 220V (Europe) and 240V (Australia and New Zealand). I’ve personally used the Tripp Lite TRAVELERC8 and it saved my laptop from a monster power surge in India, sacrificing it’s own life to save my laptop. 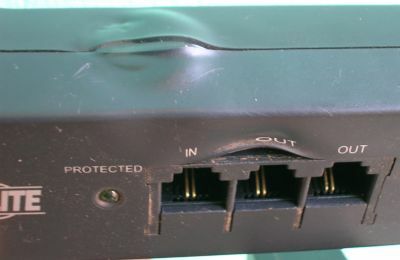 Unfortunately, my laptop’s power adapter was killed as well, but given that the laptop was left plugged in during the entire surge (it wasn’t a brief spike) this isn’t such a surprise – especially when you look at what the surge did to Tripp Lite’s surge protector (below). I can’t imagine that my laptop would have survived without it. This Tripp Lite surge protector saved my laptop. If you’ve come across a great travel-sized surge protector you’d like to tell us about, feel free to leave a note in the comments below. for most laptops don’t you just need a converter and not an adapter? You need a voltage converter if, for example, you want to use a device that is designed for 110 volts on foreign electrical current that is 220 volts. Nearly all newer laptops and many other consumer electronics will automatically sense/switch to the correct voltage. You can check this by looking at the power adapter’s specs: where it says “INPUT” it should say “100-240V” or something similar. If it says this, then you only need a plug adapter. One thing I have done is ask the maintenance person if they have one (assuming they have a maintenance person.) The other thing I have done is go to a hardware or general store and buy a power strip there if they are available. But the cube tap is a good easy answer and the extension cord is another good one.